Hey, dolls! 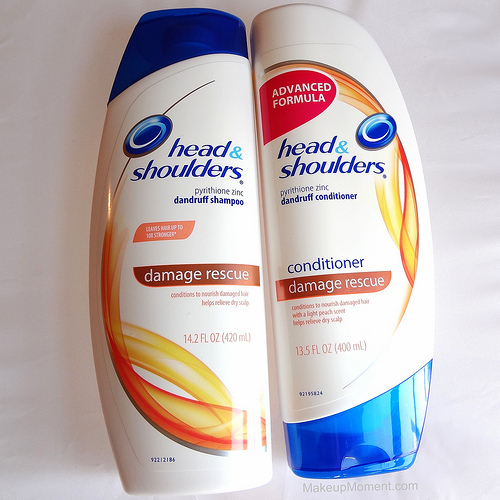 Today I am going to be sharing my new favorite shampoo and conditioner duo from Head & Shoulders with you all. I was fortunate enough to receive these two items from Influenster for review a few weeks ago, and let me just say, these couldn't have arrived at a better time. My hair was in serious trouble, and this awesome duo stepped in to save the day. Head & Shoulder's new damage rescue system was developed to help nourish the scalp, and strengthen dry damaged hair. It locks in moisture, and the formula is gentle enough for everyday use, even on color treated or permed hair. Before use, my hair was constantly dry and damaged. I was also experiencing a lot of breakage, which was very frustrating. It was obvious that my hair needed help, and none of the products that I was using were working out. As soon as I washed and conditioned my hair with Head & Shoulder's damage rescue system for the first time, I noticed results instantly. Right out of the shower, my hair felt different; a good different. And after styling, my hair was softer, it looked healthier, and shinier too. Since using this power duo (twice a week), my hair and scalp have been looking and feeling better than they have in a long time. And the breakage has significantly lessened, which is a plus! The shampoo has a fresh fragrance that just fills my bathroom with deliciousness. Those with sensitive noses may find the scent a bit overwhelming, but I quite enjoy it and don't have a problem with it. Some shampoo fragrances don't linger for long in my hair, but I am glad that this one does. It makes the experience that much more enjoyable knowing that my hair is going to smell amazing after. After rinsing off the shampoo, my hair doesn't fell stripped of or parched, and my scalp feels super clean. As for the conditioner, well, it's pretty great. It has a light peach scent that I can't get enough of, and it does a great job at penetrating into my hair to give my locks a hydrating boost, without weighing down my hair. My hair feels fantastic after I rinse off the conditioner. Very smooth. Overall: I absolutely love this duo, and highly recommend it to those who have dry and damaged hair, as well as an itchy and irritated scalp. I have been a long time fan of Head & Shoulders and always rely on the products to help with any of my scalp and hair concerns. I may try new shampoos and conditioners from time to time, but no matter what, I will always come back to Head & Shoulders. This is a friendship that is going to last a long, long time. What do you all think of Head & Shoulder's Damage Rescue system? Disclaimer: I received these complimentary products from Influenster for reviewing purposes. I am not being compensated for this review and as always, my opinions are honest, never influenced, and my own. I haven't heard of this duo before your review,but it sounds so great! I struggle with dry, damaged hair too - so this might help! I hope you give this product a try, Aly! I love it!